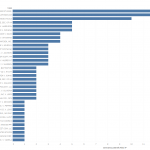 Home » SCOTUSblog » Empirical SCOTUS: Which Supreme Court cases are generating the most interest? This Supreme Court term, like the past several before it, has been slow out of the gates. It also marks another term with a new justice – this time Justice Brett Kavanaugh. The justices often find consensus both early on in a term and after a largescale change, defining or redefining their jurisprudential boundaries only later. The justices have released five decisions in argued cases so far, all of them free even from concurrences. This is a new high count for unanimous decisions without a concurrence under Chief Justice John Roberts. With five signed decisions so far this term, the Supreme Court is moving at a faster pace than it did last term (which is a good thing because last term the justices were on a record-setting slow pace). The justices have yet to hear a case that sparks great interest from the general public. This might come as no surprise, as such closely watched cases are often, although not always, argued later in a term. Yesterday’s argument in Franchise Tax Board of California v. Hyatt marked the 37th argument of the term. There is at least a modicum of built-in interest in this case because this is its third visit to the Supreme Court. But the question remains: Which cases are grabbing the public’s attention more than others? This raises a follow-up question: How can we measure this? Professors Lee Epstein and Jeff Segal developed a measure that is often cited in political science and legal scholarship in their 2000 article looking at which cases garnered New York Times front-page coverage the day after the decision was released. Others, including Empirical SCOTUS, have tried to move this measure forward by creating hierarchies of importance. This post takes another cut at measuring cases that generated the most interest so far this term, much like a snapshot of the current Supreme Court landscape. It does this by taking multiple measures of case “interest” and combining them into an aggregate measure. Things might (and probably will) change in the coming days and months. Multiple measures are used to gauge interest levels. The first measure looks at interest from (1) lower-court judges based on the number of times the lower-court opinions in these cases were cited. The number of interested parties was measured by looking at cases with the most (2) cert amicus and (3) merits amicus briefs filed. (4) SCOTUSblog case views by month (for October, November, and December 2018) were used to gauge interest from a more general yet still somewhat targeted audience. Another measure was (5) coverage from a top-five newspaper based on circulation before a case was argued. Finally, the cases that have generated the most general interest from Good Judgment’s forecasting service were also noted, although the sample size was too small to add this into the aggregate measure. The top 15 cases were ordered in each category and the overall counts were retained for certain variables. Although the absolute counts are not used in generating the overall measure of interest, they provide greater differentiation between cases as they are on a continuous rather than ordered scale. The first category with a count measure is cert-stage amicus filings. Cases in areas that affect civil liberties often generate much interest from a diverse set of groups that want the Supreme Court to take such cases, and this occasion is no different. The case with the most cert-stage amicus filings is The American Legion v. American Humanist Association, another case in a long line that looks at the placement of religious symbols on public property. Interesting and idiosyncratic cases have also generated considerable attention; Weyerhaeuser Company v. U.S. Fish and Wildlife Service, a case involving the designation and preservation of habitats for endangered species, has the second most cert-stage amicus filings. The list of cases with the most amicus briefs filed on the merits looks at bit different, but this is mainly due to the fact that the Supreme Court has yet to receive these filings for many of the yet-to-be-argued cases (as is the situation with American Legion). Weyerhaeuser leads in the merits amicus category with 28 such briefs filed. Just behind Weyerhaeuser is the class action “cy pres” (proceeds held in trust) case Frank v. Gaos with 27 amicus briefs filed. Third in this category is Knick v. Township of Scott, Pennsylvania, which examines questions of federalism in the context of eminent domain proceedings. We should expect to see many more amicus briefs filed on the merits of upcoming cases that appeal to and affect larger swaths of the general population. A third measure that looks at the question of interest (and attention) from an entirely different angle is citations to lower court opinions. The nature of the cites, whether they were positive, negative or neutral, is not as significant as whether these cases were cited at all. Citations convey that a case is already notable for a particular proposition and a bevy of cites indicates that a greater portion of the judiciary is aware of a given case, even if this population is mainly restricted to a judicial circuit. The case cited far and away the most times in the lower court is U.S. v. Stitt with 112 cites. Stitt is one of many cases that have looked at aspects of the Armed Career Criminal Act, and the extent of citations to the lower-court opinion relates to how this case affects criminal sentencing. Coming next, with a much more modest 41 cites to the lower-court opinion, is Biestek v. Berryhill, which looks at expert-testimony rules of evidence. Third on this list, with 32 cites to the lower-court opinion, is Madison v. Alabama, which examines whether a prisoner may be executed even if a mental disability leaves him with no memory of the underlying offense. The page for Gamble v. U.S., a case argued in the December sitting that looks at the separate sovereigns doctrine in the context of double jeopardy, was viewed the most in the October block. After Gamble were Madison v. Alabama and one of the first cases in which Kavanaugh participated in oral argument — Stokeling v. U.S. The most-viewed case pages in November were for cases argued in the December sitting. The top-viewed case in November, Timbs v. Indiana, looks at whether the excessive fines clause of the Eighth Amendment is incorporated to the states under the 14th Amendment. The other top cases by page views were the Indian Territory boundary case, Carpenter v. Murphy, and Apple Inc. v. Pepper, which looks at whether consumers can sue deliverers of goods for antitrust damages in certain instances. The case pages viewed the most in December are not all yet scheduled for oral argument. The most-viewed page was for Kisor v. Wilkie, which examines deference to agencies’ decisions. Next is Gamble, the top-viewed case in October, followed by American Legion, set for argument in the February sitting. These six measures were all used to create orders of cases from one to 15, with one as the case that generated most interest in these categories. A seventh category was a binary variable for news coverage, which was coded if a case was discussed in a major newspaper prior to oral argument. Cases that were ranked in the top 15 in at least four of these categories had their orders averaged (The newspaper measure was used to count if a case appeared in at least four measures but it was not included in the average because it is not an ordered variable.). Ironically, even though Good Judgment only looked at a small subset of cases so far this year, the top two cases in terms of its forecasts, Madison v. Alabama and Gamble v. United States, are also the top two cases generating the most interest so far this term. All of the cases in the top five and many in the top 10 were discussed above due to their relevance in one or more of the measured areas. With the partisan-gerrymandering cases Lamone v. Benisek and Rucho v. Common Cause now on the court’s docket, relative case interest will inevitably shift as the term moves forward. We will also gain more knowledge of group interest in cases pending argument as more amicus briefs are filed on the merits. One of the complexities of measuring interest level is that it is fluid and changes over time as well as when the choices vary. For a term that so far lacks blockbuster cases, however, this measure allows room for differentiation that might otherwise be opaque. The post Empirical SCOTUS: Which Supreme Court cases are generating the most interest? appeared first on SCOTUSblog.